I was born on Aug. 1 1965, in Columbus, IN. It's a nice quiet, low crime place. Look in my links page for more info on Columbus. 1967 Came down with muscular dystrophy. 1974-1980 Attended special ed 1 hour a day cause we disabled people don't need an education. 1980 Was expelled after getting in to it with the spechel ed principle over main-streaming. 1981 Spechel ed principle got busted for taking school property. 1983 Got a FCC amateur radio license. 1984 Upgraded to a technician amateur radio license, started a vending company, and became a salesman for Watkins Inc.
1986 Got a general then Advanced amateur radio license. 1994 as my dads health deteriorated had to quit vending then Watkins. 1995 My mom (that never knew a stranger, always had a smile, and never hated a soul) passed away. 1996 My dad (that never had to spank me because he knew how to impress good ideas on me) passed away. 1997 After paying $15,000 over a year for poor care to a couple I thought were my friends, they threw me out claming I was to much trouble. It didn't stop them from putting $8,000 on my credit cards after I left. 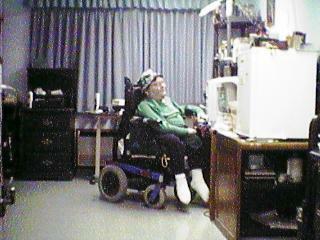 I ended up in Community Care Center of Columbus Sept. 20, 1997. 2000 An appeals hearing officer ruled (after one of the staff I was supposed to be such a threat to testified on my behalf) the nursing home had no grounds to transfer me. The nursing home went in to receivership and is now run by Sage health. 2001 Sage health has doubled staffing, and care has greatly improved. The CNA that did testify against me under threat of loosing her job became my friend after I forgave her and is now going to church. I'm trying to learn programming, but doubt I'm smart enough. Not bad for a crippled in a nursing home huh? I like to smoke. I don't do drugs, molest kids, spread AIDS, claim you'll be healed if you give me money, or sell used cars.If you don't like smokers sit across the street, find a different restaurant, MOVE! Tobacco is legal, relaxing and fun. Nonsmokers for the most part are piety, conceded, and overbearing. I have deushanes musculardistrophy the average life expectancy is 27. I attribute my longevity (36) to smoking a pipe 25 years, and dare anyone to prove otherwise. C'mon live a little! Don't forget to chekc my links to find info on everything from how your local nursing home rates to why you should vote GOP. Well it's been a while sence I updated this site, mostly because I've been busy and for the first three years that Hoosier enterprises ownd the nursing home there's been nothing to brag about. I am working on updating the sight and hope by March to have things up to date. God has watched over me my whole life and protected me from harm, and sometimes even from myself.